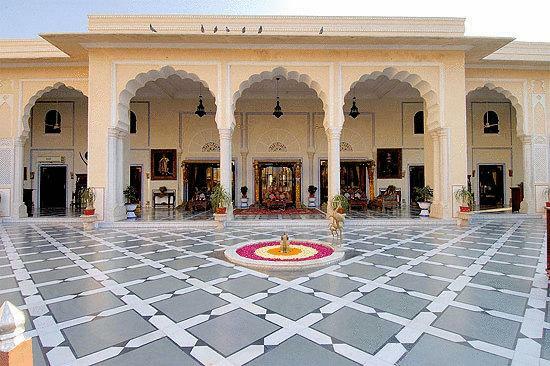 RajMahal Palace, Jaipur was constructed in 1729 AD by Maharaja Sawai Jai Singh. 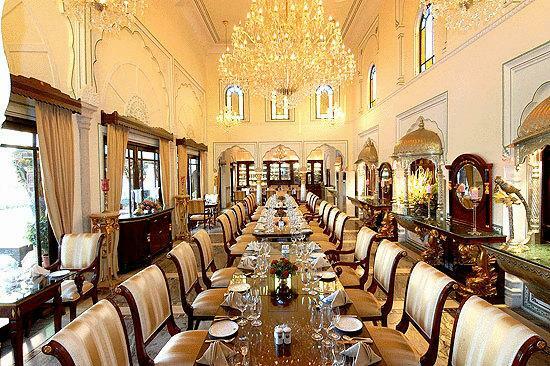 The construction denotes treasured love for his wife Maharani Chandra Kumar Ranawatiji, who was darling daughter of The Maharana of Udaipur. 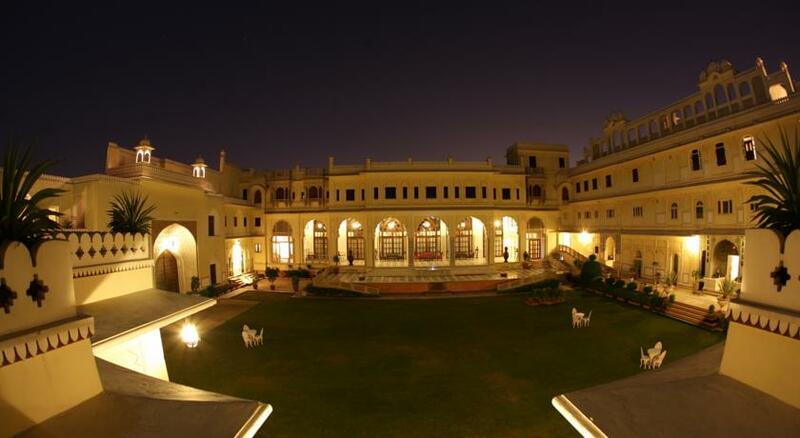 RajMahal Palace was transformed into a deluxe hotel in 1979 and is one of the hand-picked heritage hotel constructed with 30 customized air conditioned rooms. 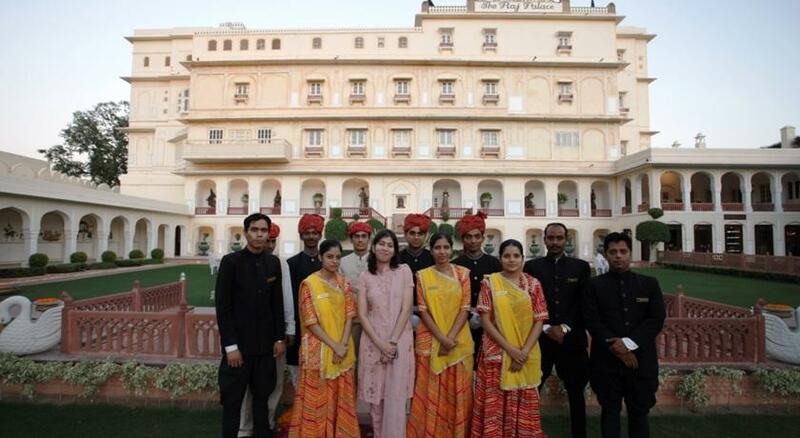 It offers an adventurous stay in Jaipur. 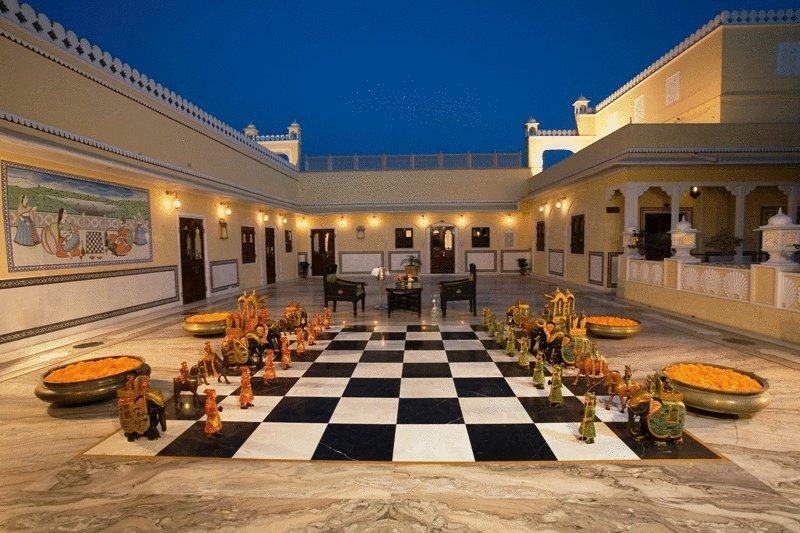 Rooms are adorned in time honoured fashion offering rich glimpse of the garden area, the Aravali hills and the river. 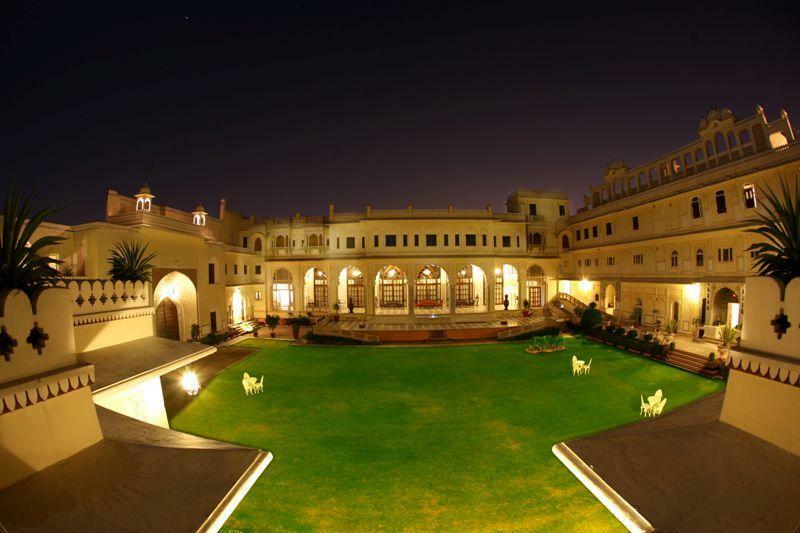 It is stretched in an area of 15 acres surrounded by vivid green lawns and is 170 Km away from Jaipur city. 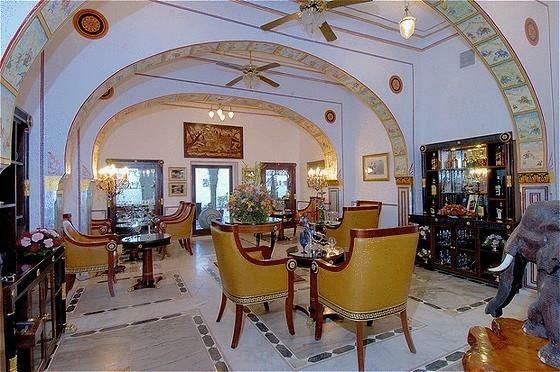 It is positioned approximately 12 Km from Sanganer Airport and around 2 Km from Jaipur Station. 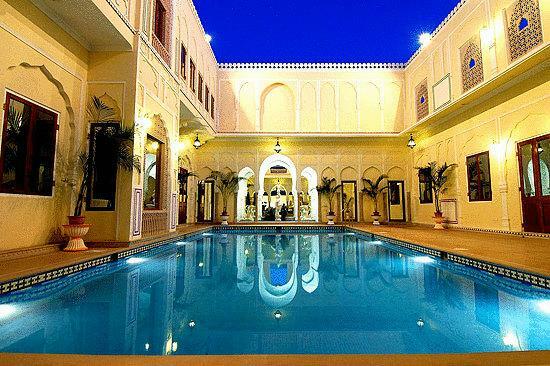 The hotel is stocked with a Swimming Pool, Outdoor games, Jogging track, Puppet Show, Trekking, Boating & Fishing, Sunbathing, Horse & Camel riding, Travel desk, Car Rental, Safety Lockers, Doctor on call, Fax Machine, Laundry, Parking, Baby sitter and Conference & Banquet hall. 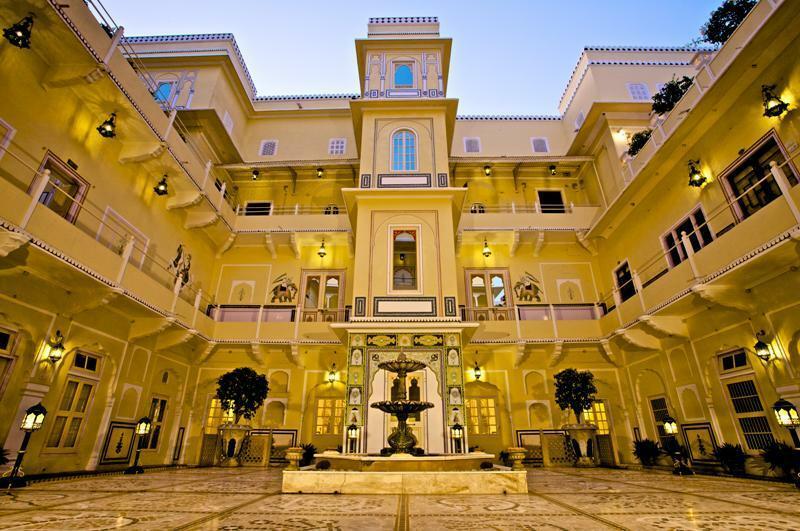 This grand paradise welcomes all its guests with benevolent customer service and sanctifies with constructive aspirations, hopes, wishes, fancies and productive imaginations everywhere encompassing its premises. 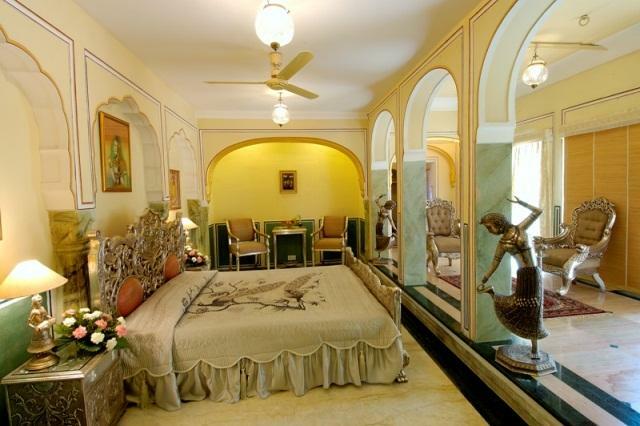 Standard room is perfect for people of varied tastes. 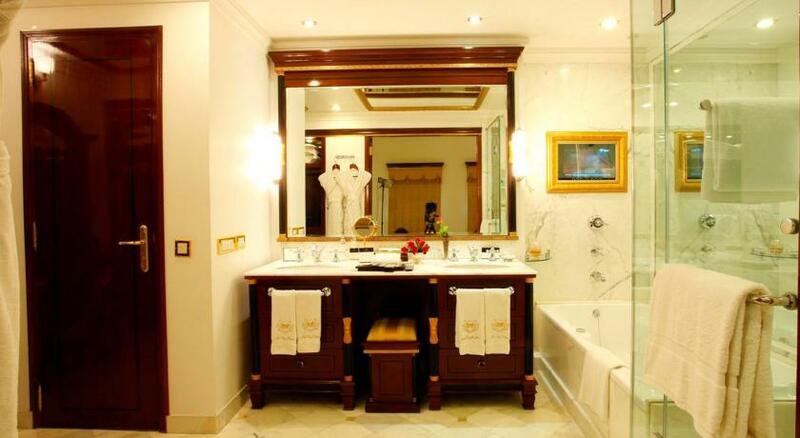 With all affluent amenities, it showers an added console to the room. Satellite TV is streamlined with popular channels that most people are amused to watch. One can regulate the room temperature on his own wish. 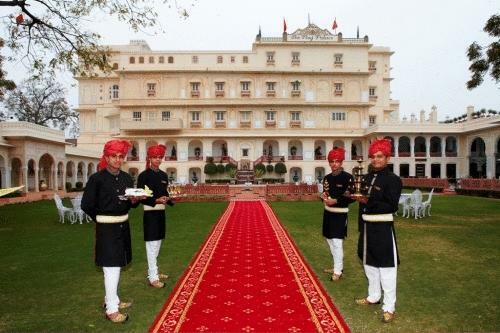 Room Service is highly empathetic and assists its customers with high diligence. 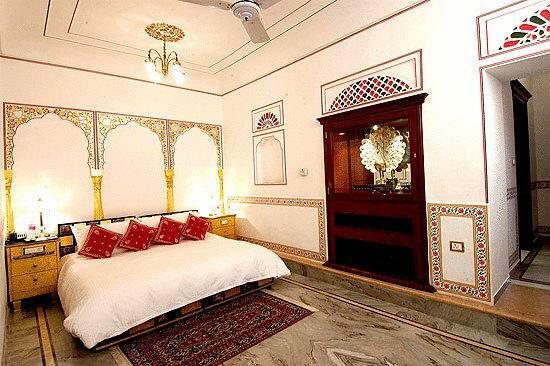 Standard room is provided with a room heater too which you can use in the freezing winters of Jaipur. 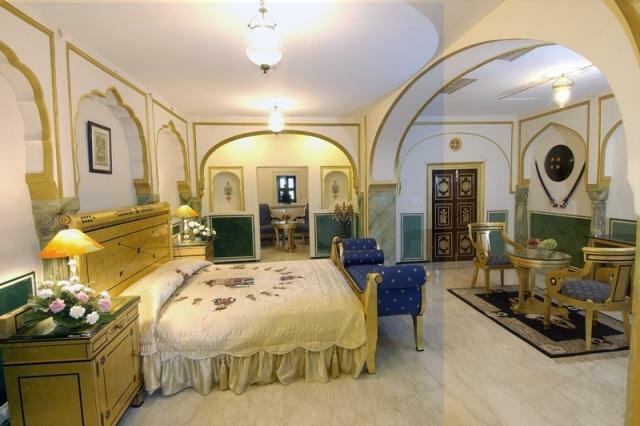 Furthermore, bathroom is not left behind in the list and is attached to the room with basic amenities of toiletries. 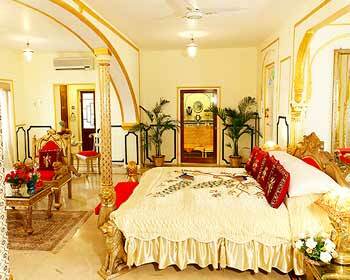 The room cascades better quality services and inserts all the comforts of a sweet home. With Telephone, Air Conditioner and Room heater, it is also endowed with a satellite Television set which makes your time a leisured one. 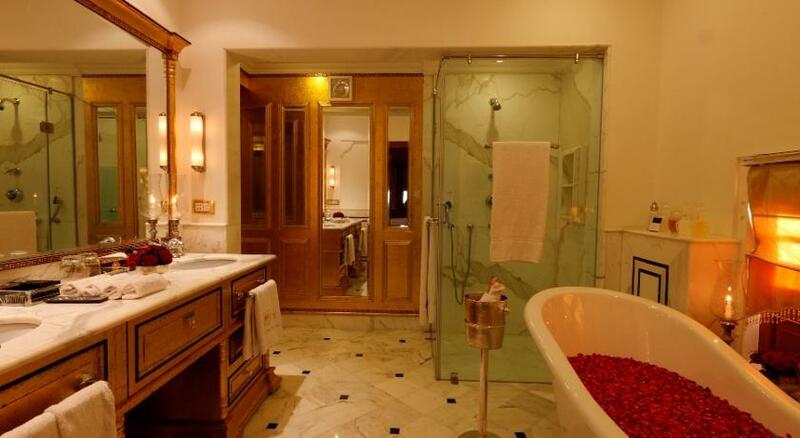 Bathroom is provided with a magnificent shower with hot and cold water connection, where guests spend plenty of time, sprinkling joy. It is maintained in sterile condition by the room service. 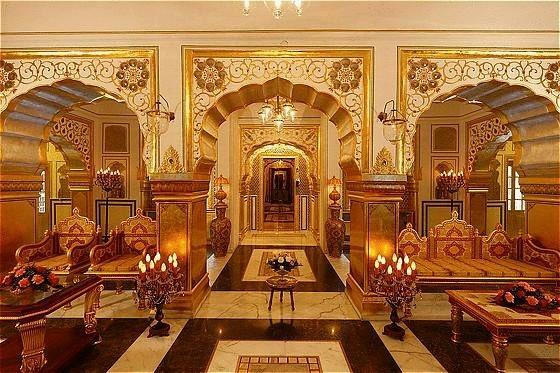 It makes a marvellous place for any visitor whether the individual has come for spending vacations or an official tour. 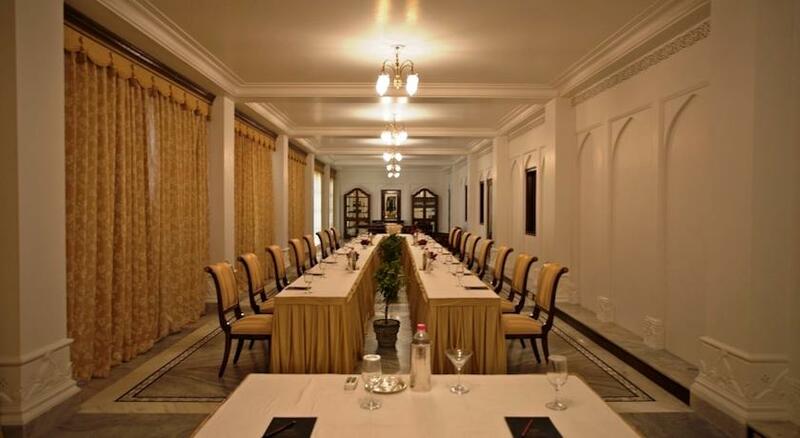 With the compassionate room service, you can demand additional facilities anytime. 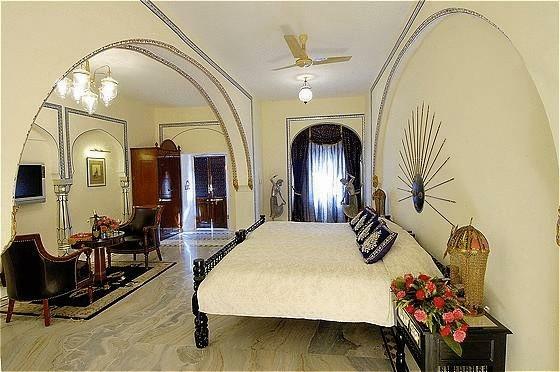 Room proffers air conditioning in addition to heater. 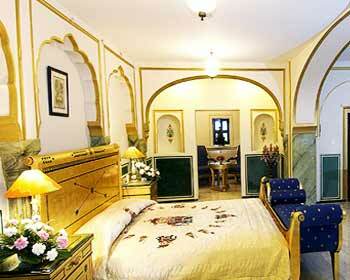 In the chilly winters of Jaipur, you can attain elevated comfort of the paradise. 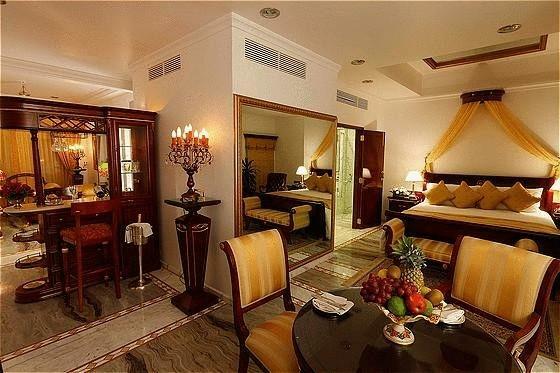 Each of the Suites is provided with a telephone line which connects you with the hotel staff. 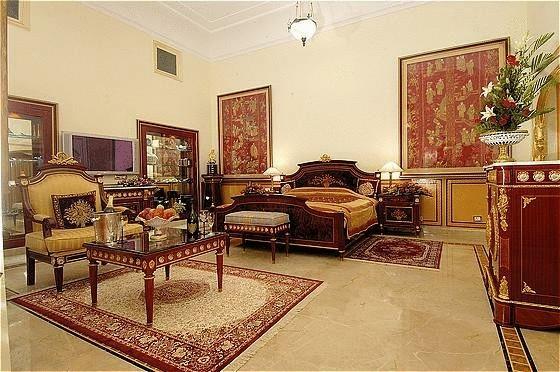 Satellite TV adds charisma to your comfort which you can enjoy while lying comfortably on the King size bed. 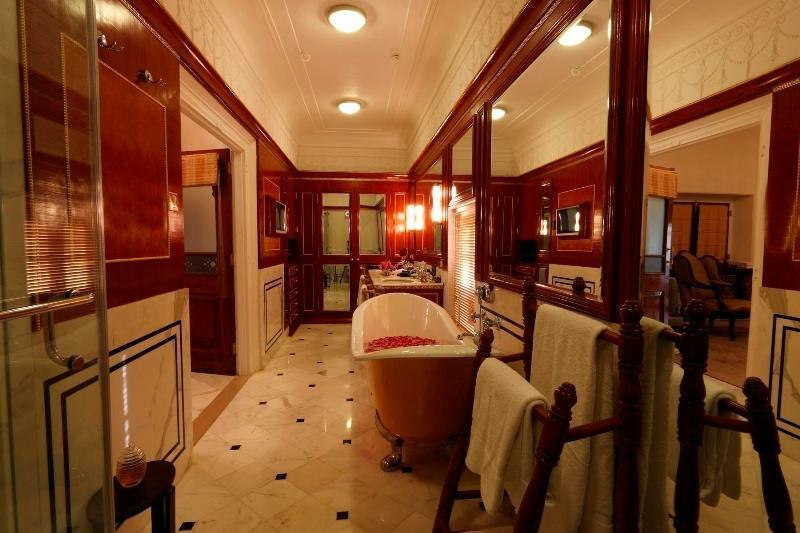 Bathroom is attached and is maintained in faultlessly hygienic condition. 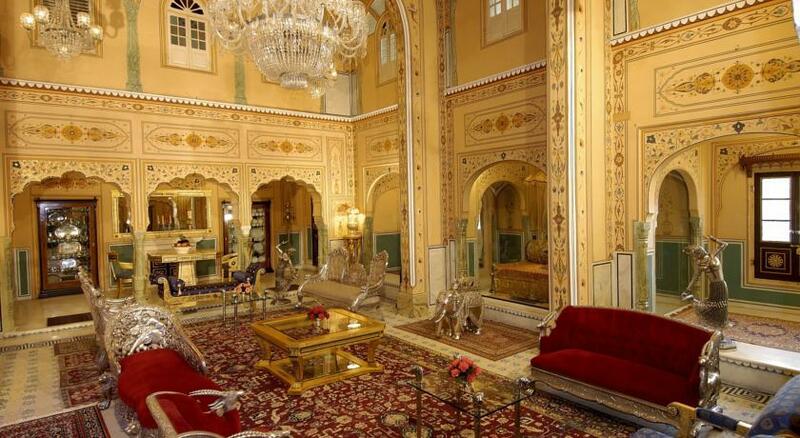 This room cannot be defined in words. Words fall short when comes to description. 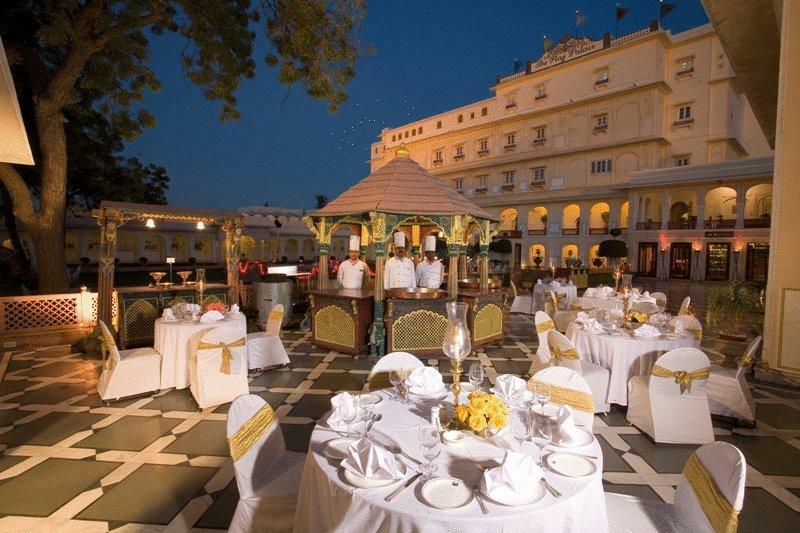 Its scenic beauty can be defined merely with eyes. 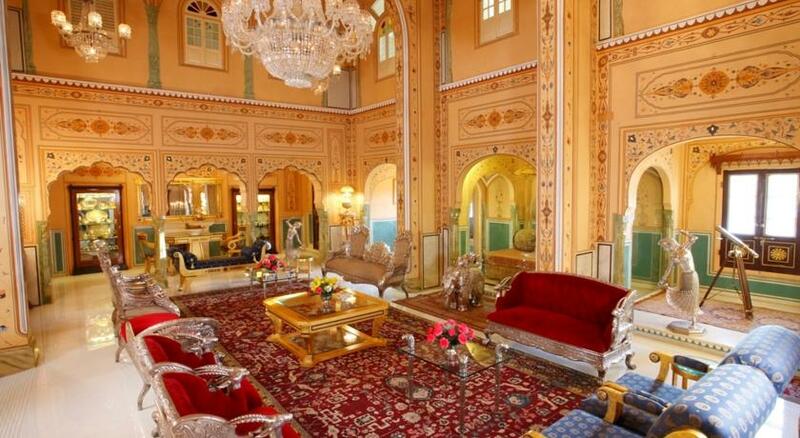 It is also known as Maharaja and Maharani Suite and is equipped with the plush of luxuries and mind blowing beauty. 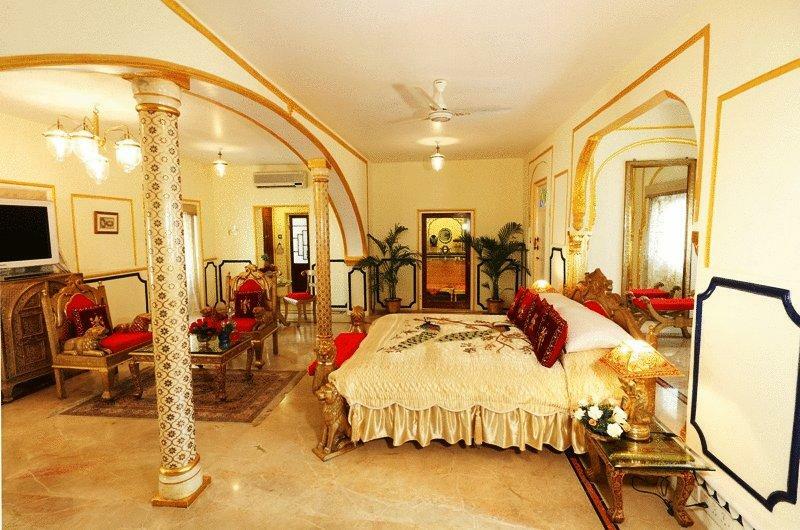 Consecrated with magnificent glory, it offers a telephone line, mini bar, centralized air conditioning and a highly professional yet humble room service to its guests. You can watch all the channels of your choice as it is linked with a cable TV connection too. 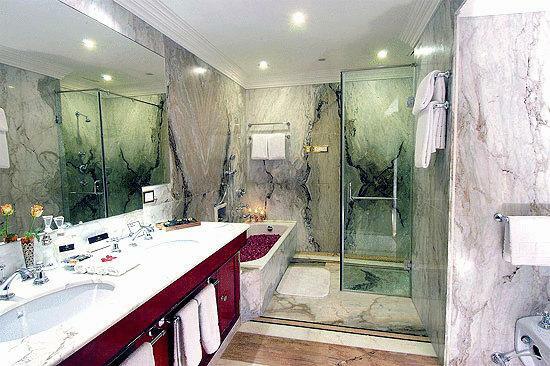 Bathroom is an elegant place to take shower and washes all your tiredness and grim. 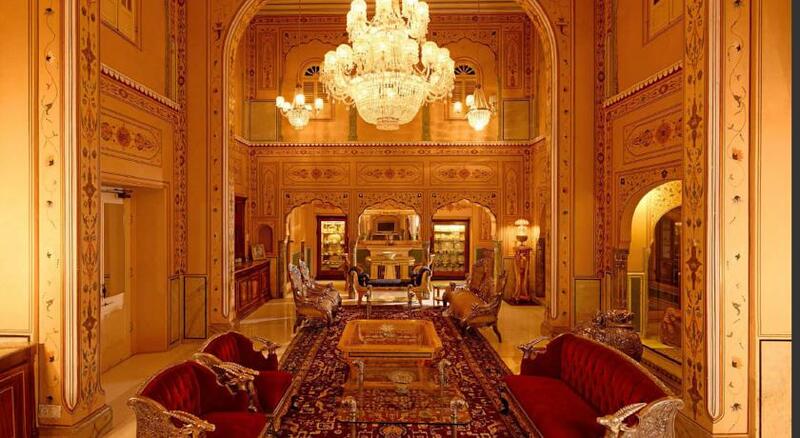 The Royal Suite is a cocoon of relief and is highly spacious and decorated with the luxuries of traditional antique furnishing. 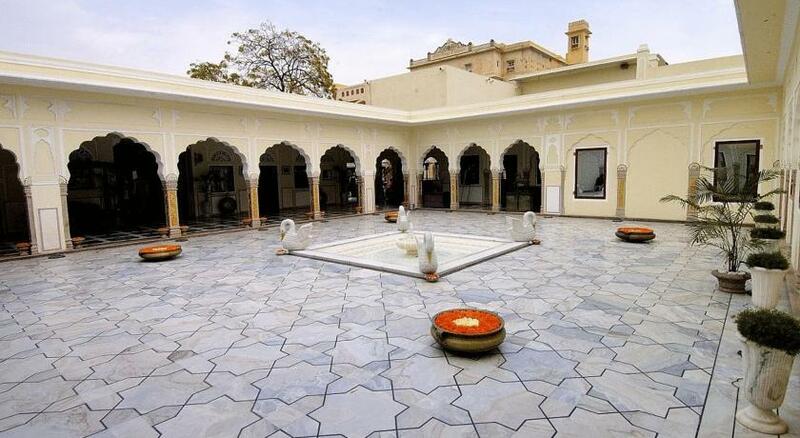 It is adorned with rich fabrics, precious paintings, antique structures and selected pieces of Royal family museum collections. 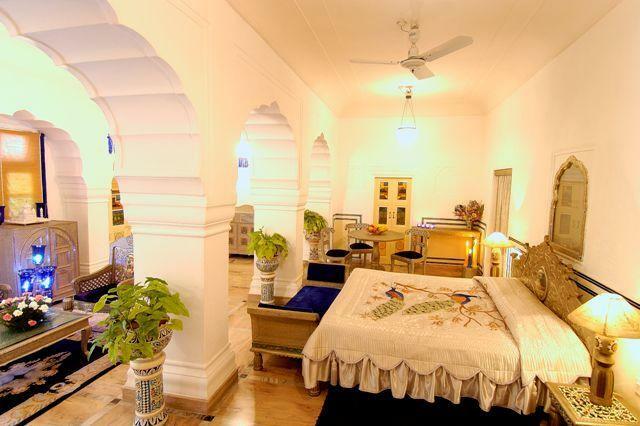 It promises an exceedingly comfortable and ecstatic stay for all its guests. 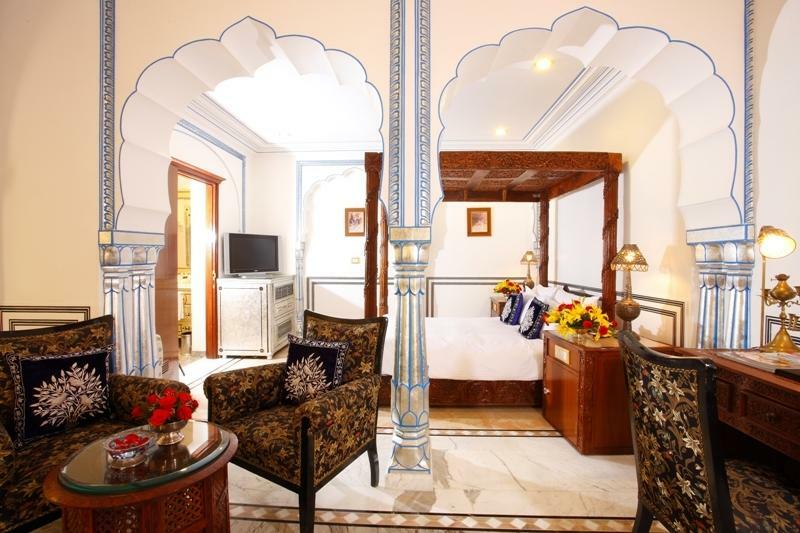 Raj Mahal Palace, Jaipur welcomes its guests into its 30 luxuriously appointed guestrooms that are further classified into standard rooms, superior rooms, junior suites and Royal Suites. 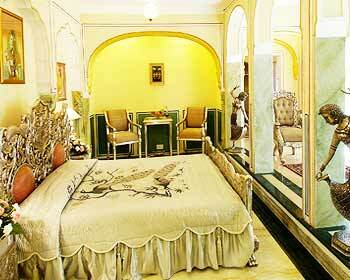 Get a taste of opulence in these guestrooms that are furnished rich fabrics, antiques and wonderful artworks. 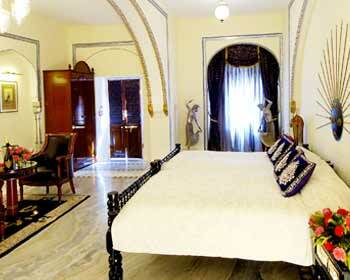 All the rooms have air-conditioners and attached baths facilitated with running hot and cold water. 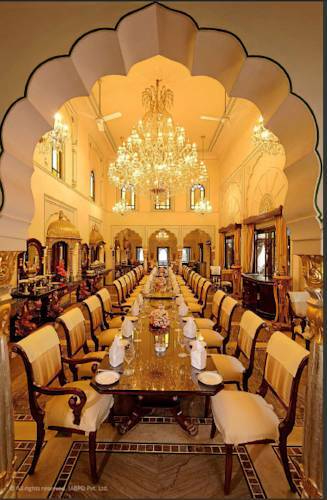 RajMahal Palace, Jaipur has an inbuilt multi-cuisine Indian restaurant that is centralized air conditioned and facilitates lip smacking delicacies of Continental as well as Indian cuisines. 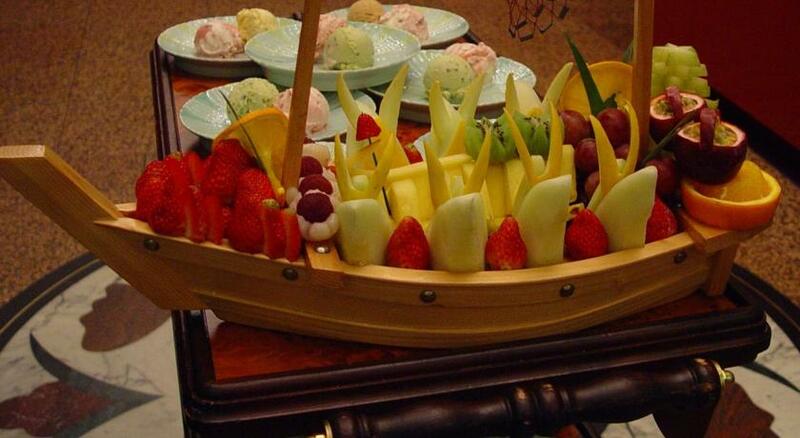 Only dine-in smoothes the progress of the restaurant. 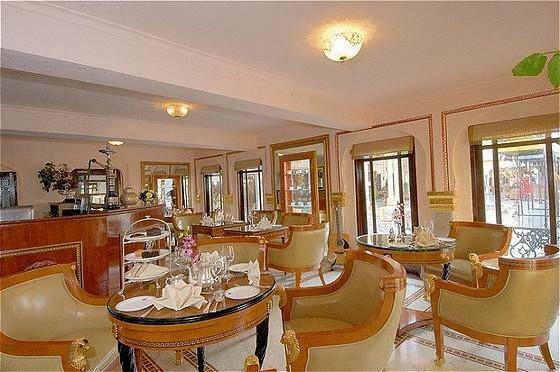 The Library Bar and Non- Vegetarian food adds magnetism and unwinds the trauma and hassles of life. 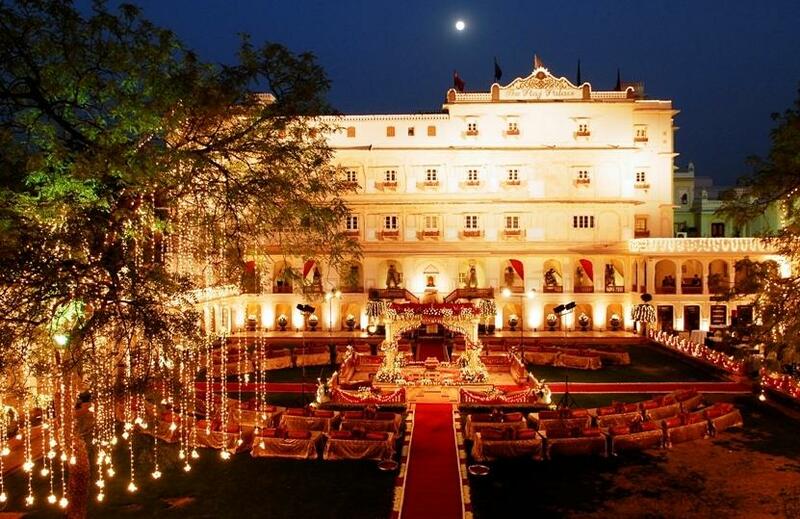 The customer service delights you to utmost and proffers outdoor sitting arrangement. 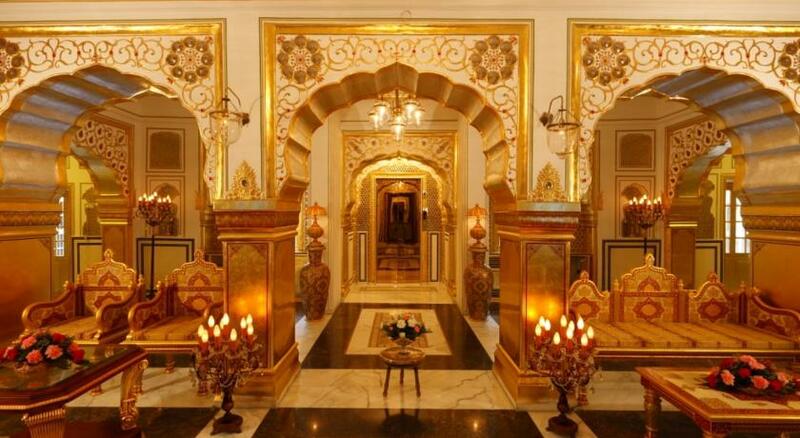 It looks amazingly beautiful and offers dynamic vividness in its interior. 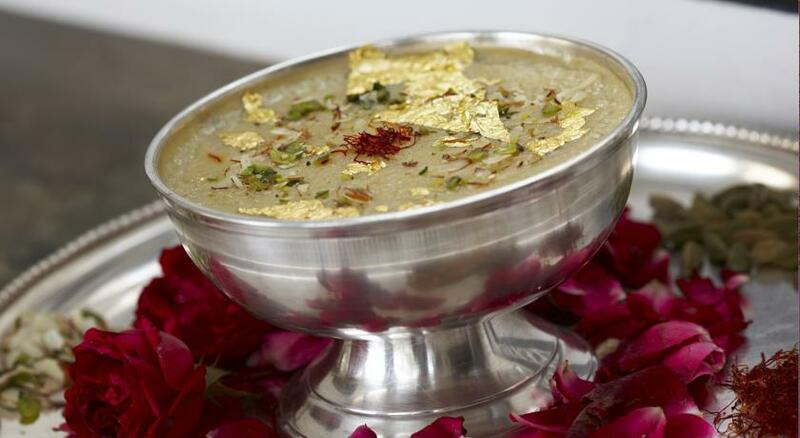 All the preparations are done by highly civilized and professional chefs. 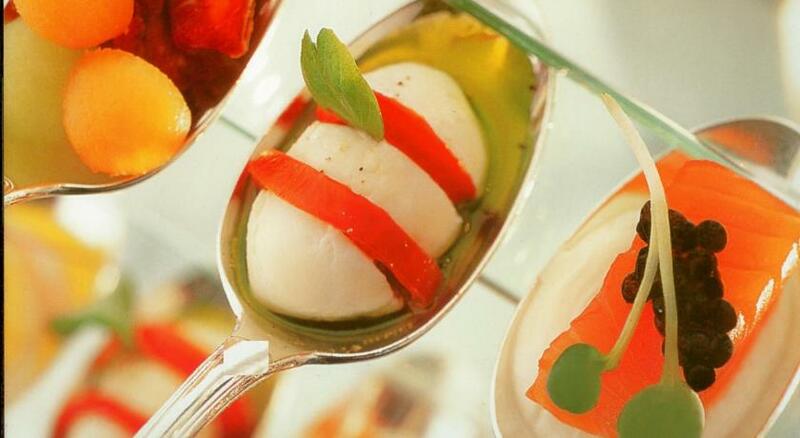 Food is served in an exceedingly sophisticated manner and maintains the high standard of the restaurant.